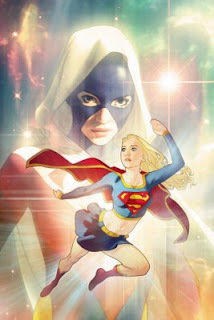 Here is the cover to Supergirl issue 38. It is drawn in ink and colored in Photoshop. It grew increasingly colorful and "glowy" as I went along. When I started out, I rendered the background character (Superwoman) in natural light, with a lot of contrast and a fair amount of detail. Unfortunately, it looked like a Sears portrait, so I kept working on it. I knew what I wanted, something atmospheric and somewhat cosmic, but for whatever reason, I kept drawing a blank on how to do it. Eventually, with a lot of constructive criticism from my wife, I stumbled onto something that worked well enough. My wife also had me reduce the size of Supergirl's left hand, which was originally rather large, although I didn't see it as the enormous baseball mitt that my wife did. Apparently, I tend to draw overly large hands with some regularity. I have also learned that I am inclined to draw gigantic heads. My wife claims that Supergirl's noggin on the cover of issue 35, the newspaper cover, is a good example of my pumpkin-headed tendencies. For those of you who check the comic book solicitations in the Previews catalog, you can see the earliest incarnation of this issue's cover in the solicitations. I couldn't finish it completely in time to make the catalog's deadline, so we had to go with what I had completed at that time. You can imagine your own wagon wheel and scenic backdrop.